If you're looking for the ideal venue to host your special event, look no further. 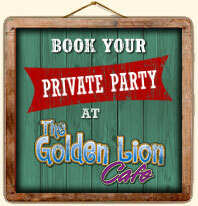 The Golden Lion Cafe has been successfully holding parties, weddings, and events since 1993. You have our assurance that your special occasion will be given the attention to small details you deserve, the service will be impeccable, and the food delicious. Whether you prefer to hold your special event on the ground floor under the pavilion or on the second story ocean view deck, during the day or under the stars at night, the only sound you will hear will be those of your happy guests, ocean waves, and tropical music. 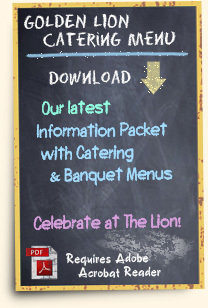 Whether a family dinner for four, an after work cocktail party with nibbles, or a full catered wedding, you can trust the Golden Lion Cafe to make your gathering perfect! Call us at 386.439.3004 or click here to contact us online.